Between Puerto Rico and the Anegada Passage are the Virgin Islands, one of the world's most compact cruising areas. Lying a 45 mile chain, the main islands are mainly mountainous, with a maze of passages between them and indented every few miles by a tempting cove or bay. The Virgins are set in a region of constant summer. Their pattern of wind and weather is predictable. Unparalleled visibility and tepid waters offer abundant views into the underwater world of multi-colored reefs and tropical marine life for the novice snorkeler and experienced diver alike. All yachts offer snorkeling and some specialize in diving. Everyone can experience the British Virgin Islands by sea. 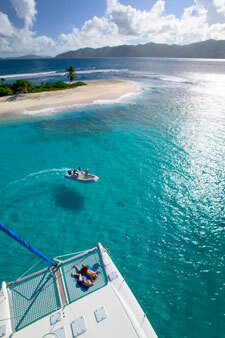 Referred to as the Sailing Capital of the Caribbean, the BVI offers the finest and safest sailing in the world. The only thing you'll need is a spirit for adventure. The BVI has the consistency of the Caribbean trade winds, clear blue water, islands close enough for a day sail, and sunshine every day. Winds generally blow northeast to southeast at 10-25 knots, and are sometimes stronger in the winter months. From the main capital island of Tortola, sailors have incredible variety in a cruising area that is about 32 miles long and 15 miles wide. A crewed sailing yacht vacation gives you the expertise and freedom to create your own itinerary amid the sixty islands and cays that form the BVI. The U.S. Virgin Islands comprises of the three islands; St. Croix, St. John, and St. Thomas. The United States Virgin Islands offers something for everyone. Breathtaking beaches with emerald water. Secluded coves, pristine coral reefs, and untouched rainforests. Friendly people with a unique music, cuisine, and culture. Posh hotels, cozy inns, and unspoiled campgrounds. Wonderful restaurants, world-class shopping, and exciting festivals. the islands offer the most romantic setting for your special wedding or honeymoon. The U.S. Virgin Islands are located in the eastern Caribbean, just 1,100 miles southeast of Miami. Surrounded by the clear blue waters of the Caribbean, the average temperature ranges from 77ºF in winter to 83ºF in summer. Each of the three major islands possesses a unique character all its own. St. Croix's Danish influence is perfect for visitors who prefer a laid-back experience. The historic towns of Frederiksted and Christiansted offer quaint shops, charming pastel buildings, refreshing cultural diversity. From horseback riding near eighteenth-century sugar mills to playing golf on one of the island's three scenic golf courses, you're sure to find something to suit your tastes. The Leeward Islands are the northern group of the Lesser Antilles in the West Indies, extending SE from Puerto Rico to the Windward Islands. The principal islands are the American Virgin Islands; the French island and overseas dept. of Guadeloupe and its dependencies; the Dutch islands of St. Eustatius and Saba; the Dutch and French St. Martin; the islands of the independent states of St. Kitts and Nevis and Antigua and Barbuda; and the islands of the British dependent territories of Anguilla, Montserrat, and the British Virgin Islands. Largely volcanic in origin, the Leewards have lush, subtropical vegetation, rich soil, and abundant rainfall. The warm, delightful climate is tempered by the surrounding water so that there is little variation in temperature. Most of the islands are popular tourist destinations. Products are mostly agricultural-fruits, vegetables, sugar, cotton, coffee, and tobacco. 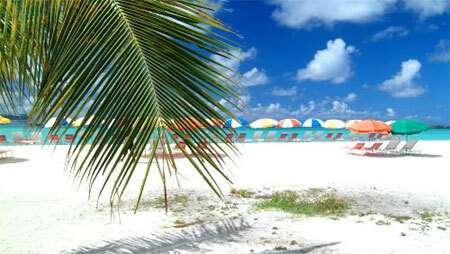 lies between the Atlantic Ocean and the Caribbean Sea, some five miles north of St. Maarten/St. Martin and one hundred fifty miles east of Puerto Rico. The territory of Anguilla comprises several offshore islets, or cays, including Sandy Island, Dog Island, Prickley Pear Cays, Scrub Island, and Sombrero Island (the location of the island's lighthouse). Anguilla has a pleasant, healthy, tropical marine climate. The hottest months of the year are from July to October and the coolest between December and February. The mean monthly temperature is 80 degrees Fahrenheit, or 27 degrees Centigrade. The relative humidity is just over 75%. Cooling trade winds usually sweep across the land from the east. Rainfall is low and erratic, ranging from 22 - 50 inches per year. Antigua, the largest of the English speaking Leeward Islands, is about 14 miles long and 11 miles wide, encompassing 108 square miles. Its highest point is Boggy Peak (1319 ft.), located in the southwestern corner of the island. Barbuda, a flat coral island with an area of only 68 square miles, lies approximately 30 miles due north. The nation also includes the tiny (0.6 square mile) uninhabited island of Redonda, now a nature preserve. 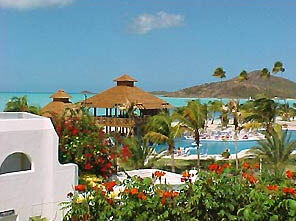 The current population for the nation is approximately 68,000 and its capital is St. John's on Antigua. Barbuda, part of the state of Antigua, and 32 miles north is a flat, sparsely wooded coral island known as a sports-man's paradise. The island abounds in bird life and supports a population of wild pigs and fallow deer for hunting enthusiasts. It offers miles of deserted beaches, excellent fishing, snorkeling and ancient shipwrecks for underwater exploration. 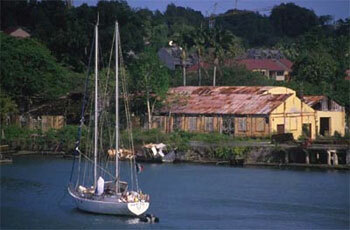 There are a few small inns, the best known being the Coco Point Lodge. Guadeloupe is the center of the Caribbean's Creole culture, boasting a spirited blend of French and African influences. As well known for its sugar and rum as for its beaches and resorts, the archipelago offers an interesting mix of modern cities, rural hamlets, rainforests and secluded beaches. Mainland Guadeloupe comprises two islands, Grande-Terre and Basse-Terre. Their principal city is bustling Pointe-à-Pitre at the centre of the land mass; the islands' sleepy capital, also called Basse-Terre, is on the remote southwestern side. Guadeloupe's offshore islands to the south and west make worthwhile side excursions. The most visited, Terre-de-Haut, is a delightful place with a quaint central village and harbor, good beaches and restaurants and some reasonably priced places to stay. The other populated islands, Terre-de-Bas, Marie-Galante and La Désirade - have very little tourism development and offer visitors a glimpse of a rural French West Indies that has changed little over time. At the southern end of the Caribbean chain, the Windward Islands archipelago stretches 200 Miles from St. Lucia to Grenada and is the best-kept secret in the Caribbean tourism lore. Situated as the last links before Trinidad and South America, the Windwards are lush and richly tropical volcanic islands green with palm lined sandy beaches. Including the magnificent St. Vincent and the Grenadines, these islands are an adventurer's dream paradise, with incredible sailing opportunities, diving on pristine and diverse reefs, walls, and shipwrecks, and fantastic island exploration hiking in rainforests, climbing majestic volcanoes, and swimming under hot-spring waterfalls. The islanders are warm and welcoming and the islands themselves are unspoiled, and safe. The diving is outstanding, and off the beaten track of tourism. Encounters with huge schools of fish, and even big pelagic animals including dolphins and rays are commonplace. The small here is also spectacular, with seahorses, frogfish and flying gurnards regularly sighted. St. Vincent and the Grenadines is a nation of many islands in the eastern Caribbean. St. Vincent is the largest and most populated island. The Grenadines consist of more than 30 small islands and hundreds of rocks, sandbars, shoals and cays (low islands made of coral). Fewer than a dozen of the Grenadine islands are populated. The country is part of the Windward Islands chain, a series of islands that form a barrier between the Atlantic to the east and the Caribbean Sea to the west. The Windward Islands also include Grenada, St. Lucia, Dominica and the French Antilles. The islands' closest neighbors are St. Lucia to the north, Barbados to the east and Grenada to the south. The northern third of the island of St. Vincent is mountainous. Parts of the area are accessible only by boat because roads cannot be built on the terrain. The highest peak is La Soufrière, a 1,234 metre active volcano. Its name comes from the French word soufre, which means sulphur. La Soufrière's last eruption occurred in 1979; careful planning ensured that no people were harmed. Most of St. Vincent's interior is tropical rainforest, where banana and coconut palms grow. The forest is also home to the colorful St. Vincent parrot, the whistling warbler, the manicou (a type of opossum), and the agouti (a furry rodent). In the coastal waters, there are sea urchins, turtles and many species of fish. The sea also attracts ocean birds such as pelicans, ospreys, boobie birds and frigate birds. Most of the island's population lives near the southern coast. Northeast of Kingstown, the Mesopotamia valley contains some of the island's most fertile farmland. North of the valley, Bonhomme, a 970-metre peak, dominates the landscape. Streams and rivers cross this land from the mountains to the sea. The Grenadine islands are also volcanic in origin, but are smaller than St. Vincent. The largest and most developed island, Bequia (the name means "Island of the Clouds"), is only 18 square kilometers. Canouan "Island of Turtles" is known for its beautiful white beaches. Union Island is mountainous. The Tobago Cays are surrounded by coral reefs. Some islands, such as Mustique, Mayreau and Palm Island, are largely private resorts for wealthy tourists. Many of the smaller Grenadines are dry and rocky, and only a few have any freshwater sources. Because the islands lie close to the equator, they enjoy a steady tropical temperature almost year-round. Temperatures range from 18º to 32ºC. The dry season is from December to June, and the rainy season from July to November. St. Vincent's northern peaks are often surrounded by clouds, but most of the rain falls on the mountains, leaving the southern two-thirds of the island much drier than the north. The Grenadines are also drier than northern St. Vincent. The country lies within the hurricane belt, and storms periodically damage crops and houses. The Islands Of The Bahamas is a 100,000-sq-mile archipelago that extends over 500 miles of the clearest water in the world. The 700 islands, including uninhabited cays and large rocks, total an estimated land area of 5,382 sq miles, and register a highest land elevation of 206 ft. Most notable, however, is that each island has it's own diversity that continues beyond geography, carrying through to the heart of The Bahamas, the Bahamian people. Population: somewhere north of 300,000. Calm waters and cooling trade winds have rightfully earned the the Bahamas an international reputation for sailing, with regattas and races held year-round. The islands are actually the birthplace of the Gulf Stream, a phenomenon that also accounts for their astonishing variety and abundance of marine life. Legendary game fish draw sport fisherman in search of the "big one," and more than 50 international fishing records have been set in these waters. The great writer / fisherman Ernest Hemingway considered the Bahamian island of Bimini a home. The same conditions that make these islands so amenable to sailors and fisherman draw visitors to the vast and diverse underwater parks. With more than 5% of the planet's reef mass, The Bahamas offer inexhaustible pleasures and challenges to snorkelers and divers. The natural beauty of the water extends to the thousands of miles of shoreline, which has some of the world's most stunningly beautiful and unsullied beaches. From the pink sands of Harbour Island and Eleuthera to the deserted strands of the Exumas and San Salvador, there is a lifetime of beaches to experience. Further inland are gardens and National Parks with rare and endangered species, such as the exotic Abaco Parrot and the Bahamian Iguana.